Last night you had a great meal and evening out with your colleagues. You came up with some great ideas for a new venture and you even made a new contact at the bar. Brilliant. Tonight though, after another long day of meetings, you need a break. Some ‘me time.’ You agreed to grab a bite to eat down in the hotel bar, but after that it’s back to the room for a film and an early night. Question is: what film to watch? Tell me more, tell me more. Do you need your business accommodation sorting? Tell me more, tell me more. Like does the hotel have nearby parking that’s free? Wait. Those aren’t the lyrics. But the fact remains there are so many famous sing-alongs in Grease you’ll do well not to wake your hotel neighbour as you happily sing along. Or perhaps, to avoid too many strange looks over your complimentary breakfast in the morning, you should stick to a quiet hum. Either way, you can’t go far wrong for a bit of light-hearted entertainment of an evening than watching old Travolta and Newton-John get along in this sugary classic. We particularly recommend it when travelling for business on summer nights. Sorry, we had to. When you’re staying in unfamiliar surroundings, cut off a little from the world and living out of a suitcase…the child in us always likes to imagine we might be a spy on some covert mission. Granted, James Bond very rarely travels for a wind-energy conference on the east coast of England, but still…we can dream. Indeed, what better way to remind ourselves of that secret agent feeling while we’re on the road than watching a bit of Bond. Pretty light-hearted but with enough action to keep you entertained, a film like Casino Royale makes for the perfect distraction when you find yourself hotel-room-bound. This one comes with a warning. If you’re missing your loved ones while you’re traveling for business, this might not be the right film to watch. That said, depending on your view of things, a romantic tearjerker like The Notebook might just be the thing you need. At the end of their lives, and with the girl now seeming to have lost her memory, one lover recounts their relationship to the other in the hope of bringing it back. It might all end in tears but you’re guaranteed to be distracted for a few hours, even if it just by the many smouldering looks of Ryan Gosling. And there you have it, that’s what our guys have on their silver screens of an evening. A classical bunch, really. But as they say, the classics never go out of style. Rachael loves a bit of Leo DiCaprio and Tom Hanks in Catch Me If You Can, a great crime caper. Ellie likes nothing more than a drifting round a corner in her car, inspired by Vin Diesel and The Fast and The Furious. Maisy is a true romantic at heart and likes hugging-up with the tissues to watch Me Before You. Connor prefers laughter to tears and you’ll catch him watching Central Intelligence. Offbeat comedy is Liv’s thing too and she laughs hardest when watching spoof-comedy, White Chicks. Meanwhile, James enjoys a Quentin Tarantino fix and particularly likes his controversial war film, Inglorious Bastards. While Katy is not messin’ about at all guvnor and likes nothing more than relaxing on the hotel bed and watching classic UK crime comedy, Lock, Stock and Two Smoking Barrels. 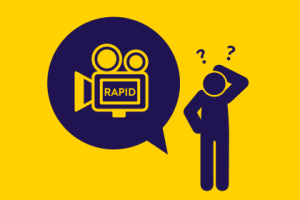 When it comes to entertainment, whether it’s figuring out how to get the hotel room TV working or finding out what’s on at the local cinema, here at Rapid Accommodation, our travel assistants are on hand 24/7 to help you out or point you in the right direction. It’s one of the many advantages of booking your business accommodation through us. To find out more, give us a call on 0330 090 41 42.